Attend! Donate a Prize or Silent Auction Item! Sponsor a Hole! $110 per person includes power cart, .dinner, silent auction and prizes! 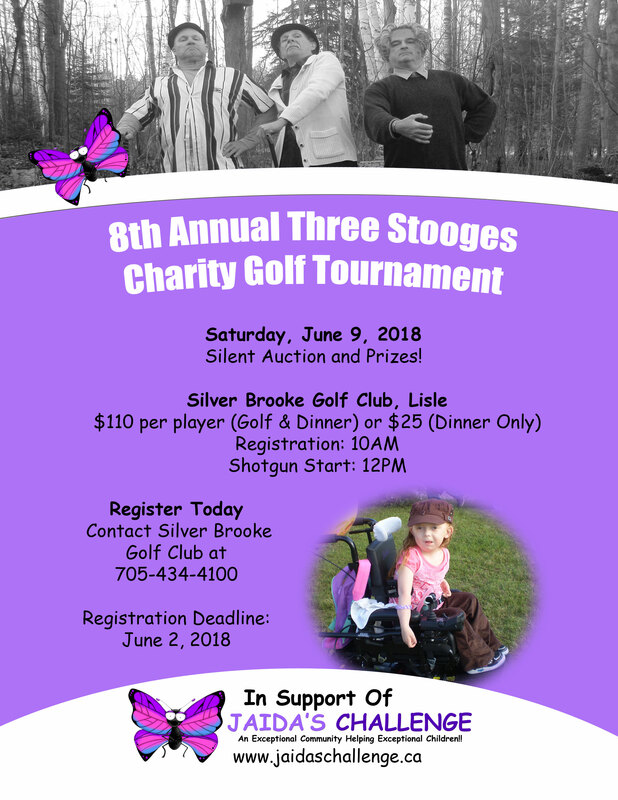 Register early with Silver Brooke Golf Club at (705) 434-4100 as the tournament fills up. If you wish to donate a prize or silent auction item please contact helen@jaidaschallenge.ca. Cheques should be made payable to CLASS with Jaida’s Challenge printed clearly on the subject line. Please do not hesitate to contact me at helen@jaidaschallenge.ca or 416-254-2307 should you have any questions or would like to arrange pick up at your convenience. If you decide to mail your cheque please attach a short note to ensure proper direction of the funds. Our mailing address is: Jaida’s Challenge C/O CLASS 125 Dufferin Street South, Alliston, ON L9R 1E9. A short email to let me know your intention would be appreciated. Attend! Sponsor! Donate! Whichever you decide to do, rest assured that you will be lending a helping hand to these extraordinary children and their families!